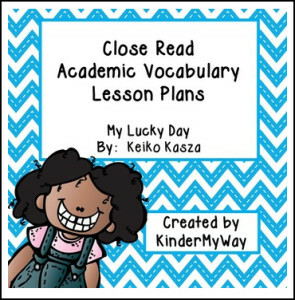 Packet includes Close Read Lesson Plans for My Lucky Day, Level 1 vocabulary, academic vocabulary, vocabulary flashcards, comprehension questions, recording worksheet for students and script for 3 days of lessons for each book. Just grab the book and read! Close Read Academic Vocabulary Vocabulary Lesson Plans – Tacky the Penguin. Read, Trace and Graph Sight Word Bundle.